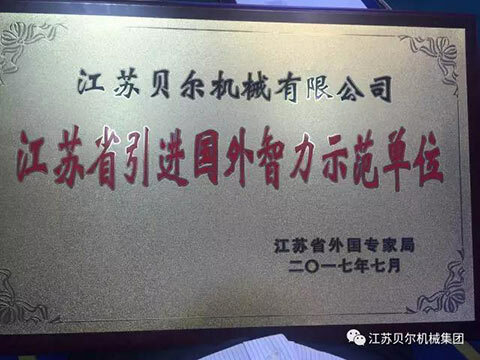 July 11th, 2017, Jiangsu BEIER Machinery is awarded ‘model company in introducing foreign intelligence’ by JIANGSU Administration of Foreign Exports Affairs. Jianguo Zhang, director of China Administration of Foreign Exports Affairs said,”with the rapid development and national focusing on scientific research, China has been considered by global scientists as a desirable country”. Under the policy of opening up, more and more foreign talents come to work in China. According to the statistics, in 1980, there were only hundreds of foreign experts in China; To 2008, the number was increased into 48 thousand ;until 2011, it was 52.9 thousand foreign experts in China. It is predicted that in the ’12th five-year plan’ period, 1.974 million foreign experts will be introduced to China. Jiangsu BEIER machinery is the first in the industry to introduce ‘foreign intelligence’ since 2014. Beier recruited a European engineer team which members are specialized in top plastic machinery engineering. They work together with our R&D team to improve quality and design of the product to narrow the gap toward to top European machines. Now we are ranked as the top 5 plastic extrusion machinery corporation in China. 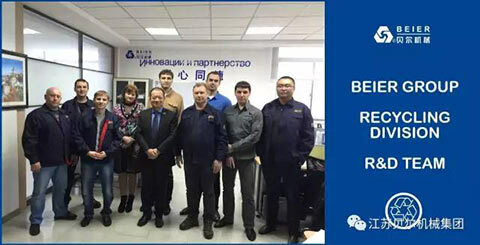 In the future, BEIER machinery will still follow the strategy of introducing foreign talents from all over the world working together with BEIER to achieve the goal of top plastic machinery system manufacturer. BEIER Machinery is specialized in providing you with pvc mixer machine,pvc high speed mixer machine,pvc compounding mixer,heater mixer,cooler mixer,pvc feeding system,pvc mixing machine,pvc automatic compounding and feeding system.